Can Big Dogs and Small Dogs Co-Exist in a Family? By Dr. Fiona, a veterinarian and writer for the pet insurance agency, Pets Best. Hi, I’m Dr. Fiona Caldwell and I’m a veterinarian at Idaho Veterinary Hospital. Today I’m answering a question from a pet owner submitted to Pets Best on the company’s Facebook page. If you get a puppy, obviously it is going to have a lot of energy, especially a Labrador puppy. The puppy won’t know the boundaries of how big they are and additionally, puppies can play really rough. 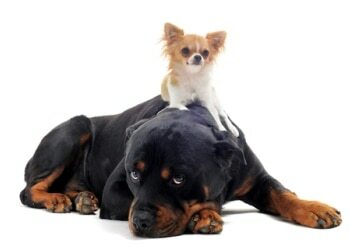 So, depending on how sturdy your little dog is, they certainly could co-exist together. We see big dogs and small dogs in families all the time, and they do just fine. I’d say that if you do end up getting a large breed puppy, you might have to just be a little cautious about how much unsupervised playtime they have together, before your lab puppy learns that maybe the older dog doesn’t always want to play rough. So, I would definitely talk between the two of you. I think it’s very possible that you could get a Lab puppy and they’d get along really well. I wouldn’t worry too much about your smaller dog being hurt. You just may have to take some extra precautions, so that she doesn’t get irritated by the puppy, or that the new puppy doesn’t inadvertently cause her harm. Thanks for the question! If you have comments or further questions, feel free to post them below or on the Pets Best Facebook page. Protect Your Pups With Pet Insurance!